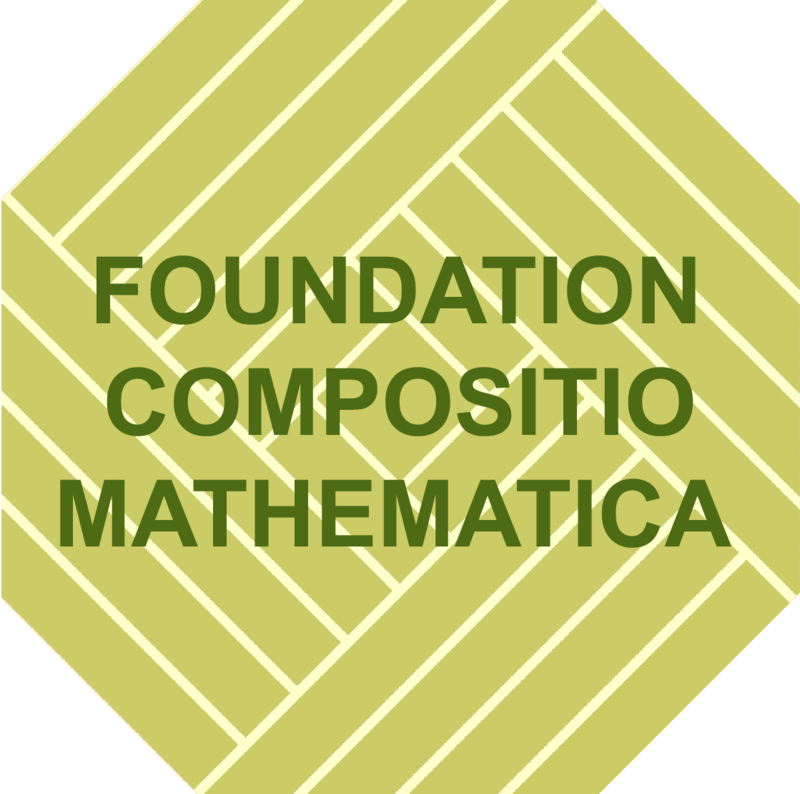 Substantial financial support for the school is provided by the Foundation Compositio Mathematica. The school is co-organised and cofounded by Banach Center and Warsaw Center of Mathematics and Computer Science. Some of the participants are funded using the support of the Simons Foundation. The school is the opening event of the minisemester miniPAGES. Its aim is to introduce the participants to the main research area studied later in the minisemester – the varieties with trivial first Chern class. Calabi-Yau manifolds, K3 surfaces and, more generally, hyperkähler manifolds play an important role in modern algebraic geometry and physics. We will have three series of lectures, each dedicated to one of these three classes of manifolds. 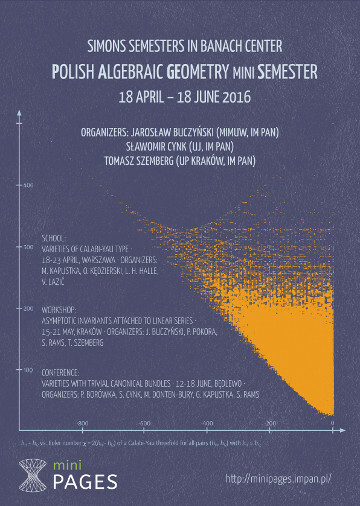 All lectures and talks will take place at Mathematics Institute of Polish Academy of Sciences (IM PAN) located at Śniadeckich 8 in Warsaw (see also the map at Locations page). "Automorphism groups of K3 surfaces and their applications"
The talk will include "Finite automorphism groups of K3 surfaces" and "Infinite automorphism groups of K3 surfaces", and their applications, for example to classification of Del Pezzo surfaces with log-terminal singularities of index \leq 2. Mainly, I will consider K3 surfaces in characteristic 0. "Calabi-Yau threefolds and sheaf counting"
The course will start with an introduction to Calabi-Yau threefolds: quasiprojective algebraic threefolds with trivial canonical bundle. I will discuss some examples, structures, and classification questions. I will then discuss questions of sheaf counting on these varieties and thus the basics of Donaldson-Thomas theory, with plenty of concrete examples. Some of the content of the lectures is covered in arXiv:1111.1552 and arXiv:1503.07349. 1. Holonomy, hyperkahler (HK) manifolds. Dimension 2: K3 surfaces. 2. Examples of higher dimensional HK manifolds. Basic general results on HK manifolds. 3. Geometry of HK varieties. 4. On the Chow ring of HK varieties. Basics on algebraic geometry; stardard references, e.g. : I.R. Shafarevich Basic Algebraic Geometry, P.Griffiths, J. Harris, Principles of Algebraic Geometry, R. Hartshorne Algebraic Geometry. Basics on topology: P.J. Hilton, S. Wylie, Homology Theory, J.H. Conway, N.J.A. Sloane, Sphere packings, lattices and groups. K3 surfaces: D. Huybrechts, Lectures on K3 surfaces. Hodge theory: C. Voisin Hodge Theory and Complex Algebraic Geometry. Moduli spaces of sheaves: introductory chapters of Huybrechts-Lehn: Moduli space of sheaves. The deadline for the registration passed on 31 March 2016.